During mating season, a sound like an asthmatic pig on a trampoline echoes from the canopy of the eucalyptus forest. It's the mysterious koala bellow, a sound that (when it comes from males) may mean "Come and get me, ladies!" or "Don't start a fight with this guy if you know what's good for you"—or something else entirely. Scientists aren't sure. But they've come a step closer to deciphering this marsupial's dialect by finding out how far its messages can travel through the trees. In earlier studies, researchers have discovered that both male and female koalas can recognize males by their bellows. They've also found that koalas can perceive the difference between bellows from large and small males. Since the normally quiet koalas save their hollering for the breeding season—in fact, males often bellow right after an attempt at copulation, whether or not it's successful— researchers think the signals help koalas coordinate their mating. For example, females might use the noises they overhear to locate their preferred mates, as in a very adult game of Marco Polo. But the information carried in a koala's bellow is only as useful as the distance it can travel to other koalas. So researchers led by Benjamin Charlton at the University of Vienna lugged their sound equipment into the eucalyptus forest to find out what that distance was. The researchers first recorded the bellows of ten male koalas at a koala sanctuary in Brisbane, Australia. They chose five recordings for each male, giving them 50 total bellows. In a eucalyptus plantation, the researchers set up speakers at a typical koala-in-a-tree height of 4 meters. They performed their experiments between 3:00 and 5:00 in the morning, a typical time for hollering by the nocturnal animals. With a speaker broadcasting a bellow, they set up a recorder some distance away to represent the ears of a listening koala. The recorder started out just 1 meter away from the speaker, then moved to 25, 50, 100, and 150 meters distant. Then the team trained a computer program to recognize the calls of each of the 10 individuals they'd recorded, just as a real koala would be able to recognize them, using the recording taken from 1 meter away. At 25 meters away, with the sound becoming distorted by its passage through the air and trees, the program could identify the right koala only half the time. At 50 meters that number was down to 30 percent, and at 100 meters the software could no longer tell which koala was which. 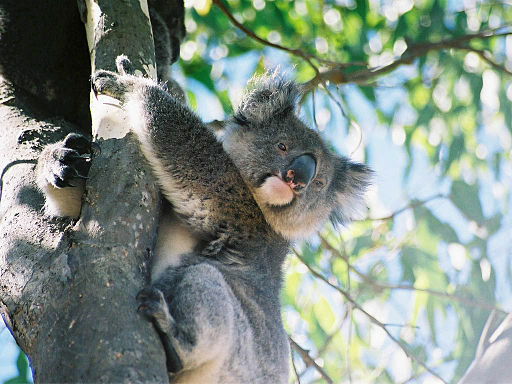 Because the computer program identified individual koalas using the same sound components that (according to previous studies) the koalas themselves seem to use, the results are probably similar to what a koala's ears would perceive. In other words, as the authors report in PLOS ONE, koalas won't have much luck identifying males by sound from farther than 50 meters. However, the specific components of the koala bellow that correspond to the animal's size stayed relatively stable over the whole 150 meters. This suggests that even from 150 meters away, koalas can gauge each other's size (and decide whether they want to get any closer). Knowing how far koala signals travel tells scientists a little bit more about what purpose those signals might serve. But there are still plenty of unknowns, including why female koalas bellow at all. The authors point out that sound recorders could be used to monitor koala populations; as long as the devices were spaced out by 50 meters or less, they could identify and track individual koalas by their bellows. That would help koala researchers keep tabs on their hard-to-spot subjects—even if they never do figure out what the koalas are saying. Image: Cody Pope (Wikimedia Commons). Sound clip: Posted to SoundCloud by NewScientist to accompany this 2011 story.